This 'General' tab allows you to configure the general settings of Bandicam. Bandicam window always on top: This feature allows the Bandicam window to stay on top of all other windows. 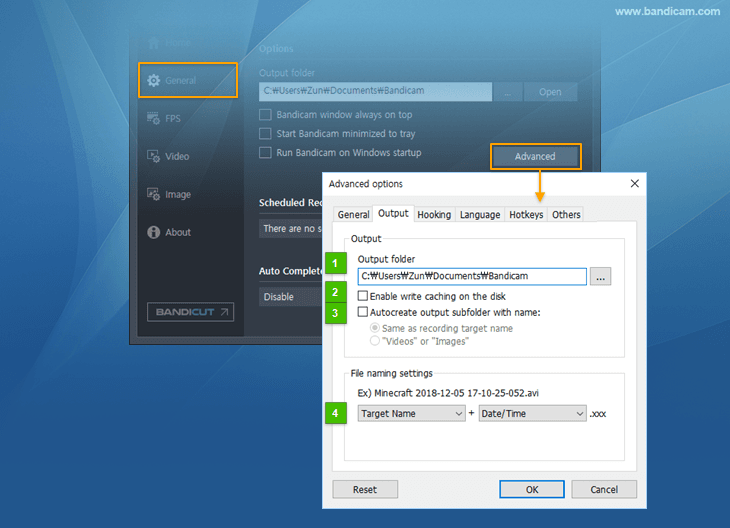 Run Bandicam when Windows startup: This feature allows Bandicam to start automatically when Windows starts. 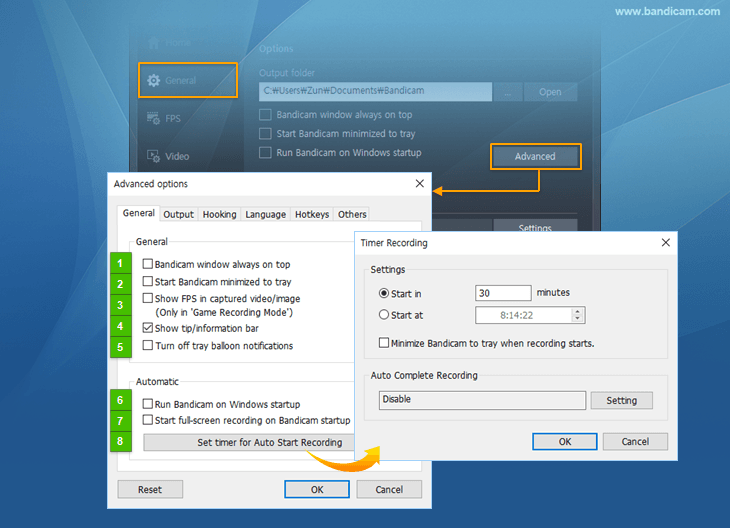 Advanced: This button allows you to set advanced Bandicam options including Hooking/Language settings. Scheduled Recording: Automatically start and stop recording at a specific time on a daily/weekly schedule. Auto Complete Recording: This function allows you to configure settings such as recording time limit, recorded file size limit and the shutdown of the system upon the completion of recording. Bandicam window always on top: This option allows Bandicam to be displayed on top of other windows. 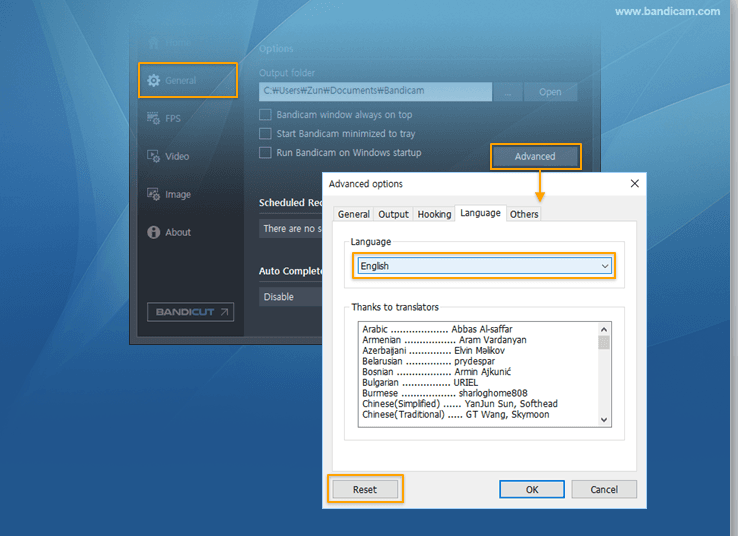 Start Bandicam minimized to tray: This feature allows Bandicam to start minimized. Show FPS in captured video/image: This feature allows Bandicam to add the FPS number to the videos/images. Show tip/information bar: This feature allows Bandicam to show the tip/information bar at the bottom of Bandicam. Turn off tray balloon notifications: This feature allows Bandicam to turn off tray balloon notification. 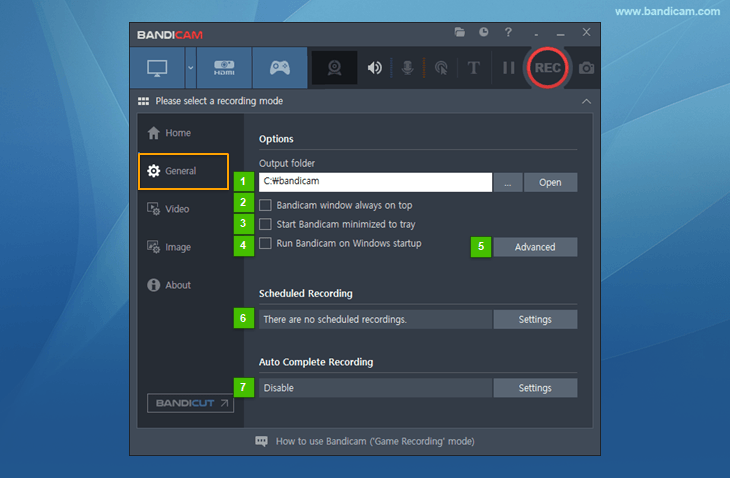 Start full-screen recording on Bandicam startup: This feature allows Bandicam to start full-screen recording. Output folder: This feature allows you to change/open the captured video and image folder. Enable write caching on the disk: If you check this option, Bandicam caches the data while recording. If you uncheck this option, Bandicam saves the data directly while recording. Save as recording target name: If the target name is "WOW.exe", Bandicam will create a "WOW" folder and save the files under the "WOW" folder. "Videos" or "Images": If this option is selected, Bandicam will save videos under the "Videos" folder and images under the "Images" folder. File naming settings: This option allows you to set the file name of the captured video and image files. Hooking target: You can choose/control the Hooking target. - If you check "Windows Apps (UWP)", Bandicam will be able to record Windows apps/games in Microsoft Store. - If you uncheck "DirectX 11", Bandicam will not record DirectX 11 games. Block DirectX video overlay: This option can prevent a black screen in ''Screen Recording' mode'. In addition, this option can improve the DirectX hooking in 'Game Recording' mode. Blocked process list: You can block a certain process/program if you don't want to record using 'Game Recording' mode of Bandicam. e.g.) chrome.exe, firefox.exe, etc. Video Record Settings: This button allows the user to set Sound and Logo. Video Format Settings: This button allows the user to set the Video and Audio codecs. Auto Complete Recording: This button allows the user to configure the Auto Complete Recording option. Reset: This button allows the user to reset all Bandicam settings to the default.